As I write this post, I'm jamming out to my "American Woman" playlist, feeling a little sun-drunk from our first shore trip of the season, and getting so excited for a forecast that won't be dipping below 65° for the foreseeable future. This style inspiration post idea came about as I was struggling to find cohesion and organization on my garment rack for the tenth time. It functions as a place to keep my day-to-day staples, sort of a short term capsule wardrobe holder, while the rest of my clothing hangs upstairs in our attic cedar closet. Lately, it was tending to only stay organized for about a week at a time. Partly because of the fluctuating temperatures, partly because of my own indecision. I'd grab something from upstairs, think that maybe it needs to stay down here, only to realize I don't wear it often enough, and round and round I went. 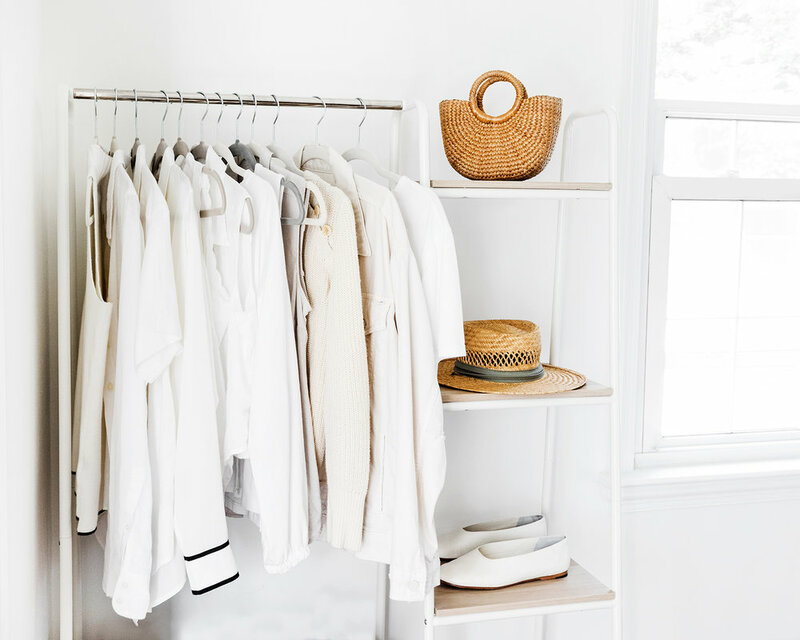 With the need for sweaters becoming minimal, I starting swapping my spring staples for summer ones, and decided to keep it neutral on the garment rack for the time being. 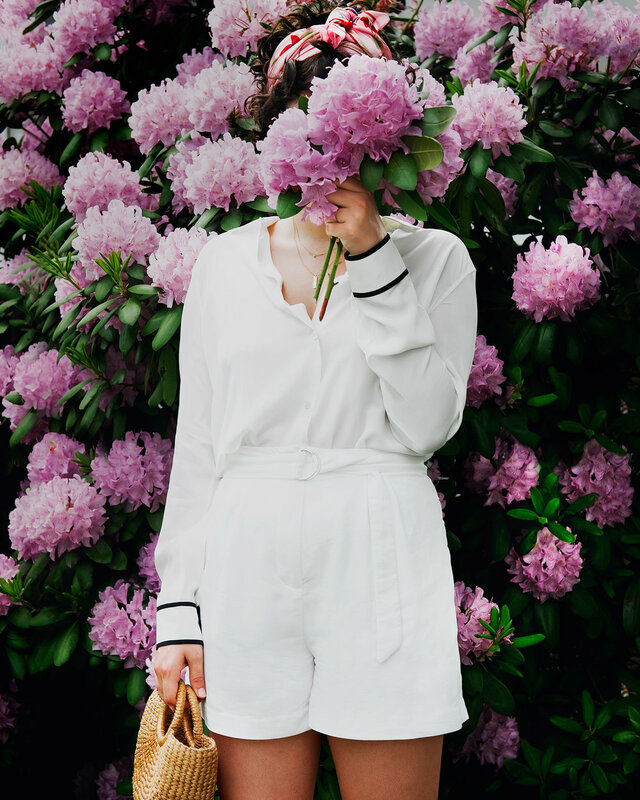 White is always my go-to, and as we move out of spring into the hot heat of summer, it felt super refreshing to just keep the crisp bright whites directly in front of me. I found the perfect size basket amongst the hundreds of options at At Home to house my denim, and it was a total game changer from keeping them stacked out in the open. If you have an At Home near you, I suggest you go ASAP. The basket aisle is a dangerous one for me, but ultimately an amazing resource when your small space needs some storage. Pieces I'm particularly smitten with at the moment? My white Everlane bodysuit. It fits like a glove and looks great with high waisted shorts + jeans. I also discovered that J. Crew's Perfect Fit Shell Top really is just that, the perfect fit, and a great basic for summer. Last but not least, my white silk button down, courtesy of the lovely ladies over at Frances Austen is incredibly gorgeous. It's luxe, versatile, and a trusty staple that dresses up, just as well as it dresses down. Shop some of my favs below!